Hard cover book by author Dusan Smetana. Book size is 10" X 8" with 136 pages. Whoever it was who coined the cliche, “They’re not for everyone” had to have Jacks in mind. 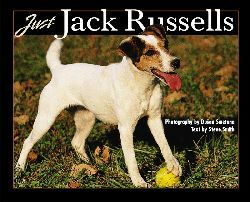 Living with a Jack Russell terrier is an experience, but it is not difficult if you know the rules: Rule One — Jacks love adventure; Rule Two — Jacks love to have fun; Rule Three — in case of any misunderstandings, refer to Rules One and Two. Feisty, high-energy, adorable — when referring to dogs, these words all bring to mind the fun-loving Jack Russell terrier. In this tribute to the Jack Russell terrier, over 200 lavish color photographs are accompanied by spirited obversations about this intelligent, spunky, and irresistible little dog. Featuring the remarkable work of award-winning photographer Dusan Smetana, this collection is stunning in its depiction of Jack Russells at home, in the field, and at play.